String Me Along: Baby, Its Cold Outside. Although it has been an unusually mild November, Jack Frost winks at me at each morning. It will not be long before the deep Canadian freeze settles in to stay for an extended period. Soon I will need to add an extra five minutes to my day to bundle up in layers and layers of scarves, mittens, hats, etc before heading out. I can't say that I mind too greatly, after all I have a great fondness for scarves and relish the opportunity to add a new one to my already overwhelming collection. If you find yourself without an adequate supply of warm winter gear however, fear not. I am here to point you in the right direction. Now, because of my bias let's begin with a discussion on scarves. I love a nice long scarf that wraps around and around, allowing me to bury my nose, protecting it from the chill. And since you may see nothing more of me than the narrow strip between mid-nose and eyebrow, I better play up my hazel eyes. A scarf in blues and greens will brighten them. I do believe that this stunning scarf from Fluur, measuring more than a generous 58 inches would be a perfect option. 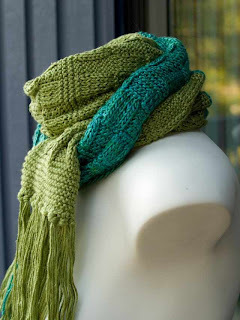 It even has a super-long fringe which is always a fun addition to a scarf. Now sometimes, okay rarely, I go someplace that requires me to dress up a little more, and on occasions like that, I like to have a shorter, flouncy scarf that can be kept nearby if the event area has a chill. 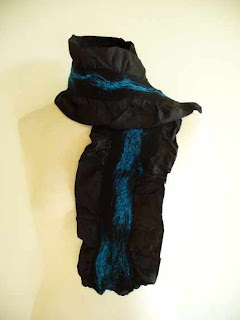 Since I have become a huge fan of nuno-felting lately, this gorgeous scarf from mireilles caught my eye. I adore the vibrancy of the blue against the inky black. Now, maybe my second favorite thing about winter is mittens and I can't explain why but, I have an unexplainable penchant for red mittens. 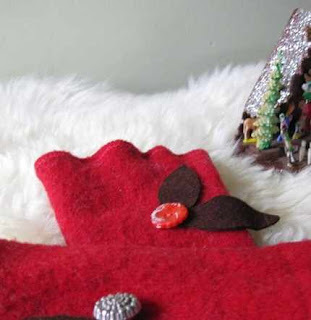 I also think that fingerless mittens\gloves are a brilliant invention. As someone who likes to go out with a camera in the winter, I like to have fingers free for that perfect "Click" moment. You don't always have time to rip off a mitten before the moment passes. I think they can and should be pretty, though as well as practical, like these pretties by mosey. Did you know that you lose most of your body heat from the top of your head. Stay warm and combat winter's bad hair days with a gorgeous hat. 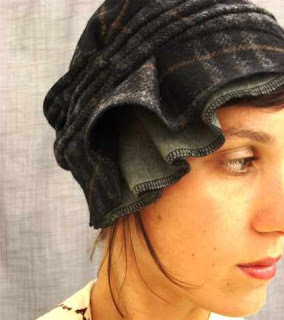 I love this layered cloche style from lizarietz. If you wish to be a winter princess, this caplet is mandatory. It is just so gorgeous and flirty. This caplet is from Nortique, who from cold and snowy Newfoundland, should know a thing or two about looking fresh and pretty through a long, cold winter. Do you think that there is any coincidence that three of the above sellers are from Canada? We Canadians know how to conquer the winter months with flair. How to Keep Her Happy This Christmas.